PROUD TO BE A COLORADO CHAPTER WORKING HARD FOR OUR FUTURE! Columbine Chapter, Order of DeMolay meets every 1st and 3rd Thursday of each month in Grand Junction Colorado. Our meetings begin at 7:00 pm and usually last about an hour. Every 1st meeting of the month is a formal meeting, and the 2nd meeting is a casual meeting. WHAT IS COLUMBINE CHAPTER UP TO NOW?? Columbine Chapter is always working hard, having fun, and bringing in new members! We're working for the future and mixing our history with today's changing needs! We were able to send our members to Convention, and they've come back very excited and ready to do great things! 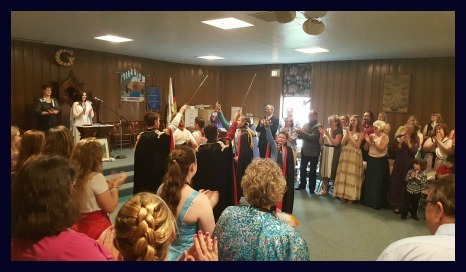 Recently, we were able to perform an Arch of Steel for the newly instituted Rainbow assembly, Gunnison Assembly #99. The young ladies of this assembly can be very proud that they belong to the first new assembly Colorado has seen in about 30 years, and we are very proud that we could be a part of the history they made that day! 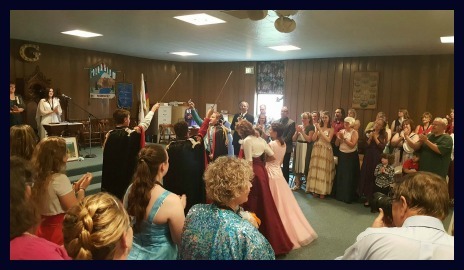 We continue to have a great time, and we work hard to make sure we're growing and making the Western Slope and all of Colorado DeMolay proud! Next time you're visiting Western Colorado, make plans to stop and see us! We always welcome visitors!